When I first arrived at John Burns park, the DJ was spinning Spirit in the Sky while pee-wee wrestlers were competing and the older divisions were registering athletes. It’s a song I remember from my youth, and when I left the park, it’s been replaying in my head since. The song hit the Billboard charts in 1969 and played on radio throughout much of 70’s. It is about where you go when you die. Knowing the spirit of a wrestler, I have a feeling that for many in attendance, John Burns Park on Friday evening was such a place. A clear blue sky, a warm breeze, 5 wrestling mats, referees, friends old and new, girlfriends, mothers, fathers, Al Bevilacqua, Frisbee, Football, Hot Dogs, soda, and Spirit in The Sky, what more could a wrestler ask for? 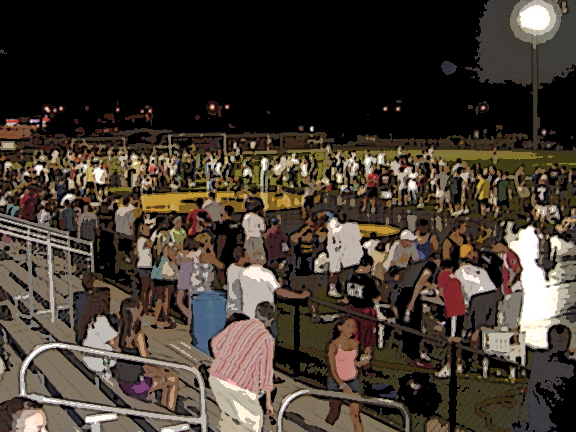 The Friends of Massapequa wrestling held a very successful 2nd annual Friday Night Lights tournament on July 9th. Athletes from near and far, from yesteryear to this year participated in a festive tournament where winning was secondary to oiling up the joints, trying out some new moves, and meeting up with old friends. There was Dom Marino a 135lber for Brentwood in 1977 competing in the masters division at 179 pounds to Pee Wee wrestlers reminding us where we once were. 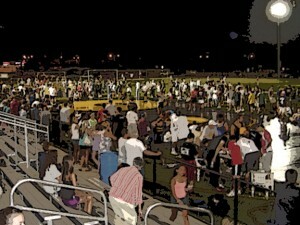 It was a great tournament, and if you didn’t make it this year, give it a try next year. You won’t regret it. Below is a highlight video from the event. During the week, I will post some in depth interviews from the event.